A few years ago I had the opportunity to watch a video made by Rick Larson appropriately entitled The Star of Bethlehem. The fascinating video shows how advanced computer software can simulate what the night sky looked like nearly 2,000 years ago when the magi followed the star of Bethlehem. 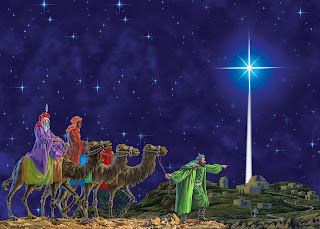 The video clearly demonstrates what the magi must have seen; how the star they followed was an especially bright "star"; how it did, in fact, move through the night sky during their journey; and how it then miraculously stopped over the town of Bethlehem. The video is extremely well done and well worth watching! By the way, a little before Christmas time last year I tried to order copies for some friends and family members and found that copies were hard to buy for delivery before Christmas. Therefore, if you are interested in getting a copy, I recommend you order now, watch it when it arrives, and then watch it again at Christmas with friends and family. Not only will it fascinate you, but you will find it to be a wonderful witnessing tool. Visit THIS PAGE to learn more about this fascinating DVD. As Dr. David Reagan explains in his book Wrath and Glory (page 36), “The first five verses of Revelation 12 tell the story in symbolic language of how Israel gave birth to the Messiah and how Satan tried to kill Him at birth”. As one watches the video and relates that concept to the symbolic flashback we see in Revelation 12, it provides an amazing look at God's profound Word and omniscience. Unlike what many scholars must have experienced for many centuries after Jerusalem was destroyed at the hands of the Romans and Israel ceased to exist, we now have the luxury of knowing, without any doubt, that God's Word in that passage meant exactly what it said since Israel miraculously became a nation again in 1948. Indeed only recently has end-times Bible prophecy become as understood as it is today, which is quite encouraging given what God told Daniel. Daniel wrote, “I heard, but I did not understand. So I asked, ‘My lord, what will the outcome of all this be?’ He replied, ‘Go your way, Daniel, because the words are closed up and sealed until the time of the end’” (Daniel 12:8-9). As you can see, Daniel did not understand what God was asking him to record. When he asked the Lord what the outcome would be, God replied that the words were not meant for Daniel to understand and, in fact, they were to be “closed up and sealed until the time of the end.” Now, however, we have a lot being unsealed before our very eyes. First, we have the Book of Revelations which is becoming increasingly more understandable as we watch today's news headlines. We also have seen Israel become a nation just as the Bible predicted. Finally, though not completely necessary, God allows us to make scientific discoveries, such as the Star of Bethlehem, that help us understand scripture more than ever. The logical conclusion is exciting because we can reasonably conclude we are now living in “the time of the end”.